I am slightly obsessed with pickles and have been for most of life. I am one of those savory over sweet people that loves a good pickle and will take down a jar in one sitting. I’ve had deep fried pickles at restaurants many times. Truly, it has probably every time that I see it on a menu. I’ve been dying to try to make them and felt compelled afterI found these yummy looking bread and butter pickles. 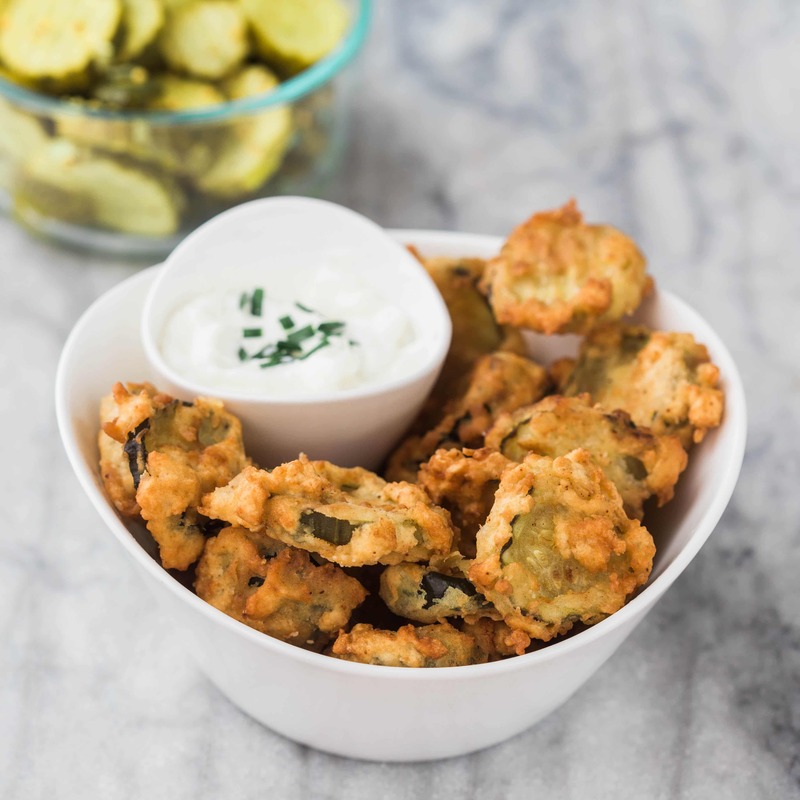 We used the deep fryer for the first time today to make these excellent deep fried pickles. I know that you will love them as much as I do! Pour the Oil in the fryer. Heat the Oil until it gets to 350 degrees F.
Pour the pickle jar over a strainer to drain the pickles. In a large bowl, pour the buttermilk. You will use this for dredging. In a large ziplock bag, add the 3 cups of flour and all the spices. Close the ziplock and mix the spices with the flour. Dredge the pickles in the buttermilk, then put the pickle in the flour and repeat the buttermilk and then the flour again. Using a slotted spoon, drop the pickles into the fryer. Fry the pickles for 2 minutes on each side. You can flip them by pushing on one side of the pickle. Line a large plate with two paper towels so that the oil can drain off. Pick up the basket out of the oil and let sit for a minute so the oil can drain and the fryer basket can cool. Flip the basket over the paper towel lined plate to sop up the oil. Line a large plate with 2 paper towels so that the oil can drain off. Wow! This looks super tasty. Good call on the pickle choice too. You left out the most important part! A good sauce!